2.1 What Hawaiian terms do I need to know for traveling Hawaii's highways? 2.2 How do people give directions on the islands? 2.3 When I asked a Hawaiian a question about "route 99," all I got was a blank stare. How much do Hawaiians pay attention to route numbers, anyway? 2.4 Some roads are shown with route numbers on maps, but when I try to find them I don't see any route markers. What gives? 2.5 How reliable are on-line or CD-ROM maps for the islands? 2.6 When I honk my horn at Hawaiian motorists to get them to move along, I get rude gestures in return. Why? 2.7 Speaking of gestures, someone waved at me like this [making a fist with thumb and pinkie finger sticking out in opposite directions]. What did that mean? 2.8 How hard is it to navigate around Waikiki and downtown Honolulu? 2.9 What about parking in Waikiki and downtown Honolulu? 2.10 What are the speed limits like in Hawaii? 2.11 What's speed enforcement like in the islands? 2.12 Are there any auto ferries between the islands, so I don't have to keep changing rental cars? 2.13 How expensive is gas in the islands? 2.14 How difficult are the Hana and Piilani Highways in east Maui? 2.15 Why do rental car companies hate the Big Island's Saddle Road? What other roads in Hawaii don't they like? 2.16 With those active volcanoes on the Big Island, there must be 50 ways to leave your lava . . . r-r-r-right? 2.17 What's with all those civil defense sirens, especially along the coast? 2.18 What's the meaning of all those "kapu" signs often seen along roadsides? 2.19 How common are rest areas or truck stops along Hawaii's highways? 2.20 Why do Hawaiian highway and place names, and other words, have so many vowels? 2.21 Where can I get more help with Hawaiian words and place names? Many of these terms are also discussed, in more detail, in some of the items below. To supplement the usual north, east, etc. directions, people often will include in their directions "mauka" (toward the mountains) and "makai" (toward the sea). This is most common on Oahu, Kauai, Lanai, and the Big Island (it doesn't work as well in central Maui, where there are mountains both east and west, and the ocean both north and south, of the island's main population center). Also used are the nautical terms "windward" and "leeward," for "east" and "west" (at Hawaii's latitude, the trade winds normally blow in from the east -- so that side of each island gets much more rain than the "leeward" side, as the mountains wring moisture from the winds). On Oahu, where the city of Honolulu is on a roughly northwest-southeast axis, people will also use as directions "ewa" (pronounced "eva") for destinations toward or beyond the community of Ewa west of Pearl Harbor, and "diamondhead" or "kokohead" to point toward the southeastern end of Honolulu. These conventions notwithstanding, highway and street signs in Hawaii use standard north, south, west, and east designations. Not much. Hawaiians usually refer to highways by name, rather than number, and so you should use both when you ask for directions. (You still want to remember the number, since route numbers are more visible on most highways than route names.) The only exceptions are Interstates H-1, H-2, and H-3, which until 2002 had no other names (except for the eastern third of H-1), and are still generally called Interstate H-1, etc. A more detailed discussion of this subject appears later in these FAQs. Some highways have "secret" route numbers that are not displayed on roadside signs. Until July 2004, one of them was the mysterious Interstate H-201. But more often, road maps (both paper and on-line) show route numbers that may once have been signed, but were changed or removed ages ago. So if you don't see the route markers you were expecting, that doesn't necessarily mean you're lost. Follow local custom (see preceding item) and look for the route name. 2.5 How good are on-line or CD-ROM maps for the islands? While some old mapping websites and CD-ROMs don't cover Hawaii, most do cover the state. Indeed, each of my route lists has a link to a Google on-line map for the island(s) covered by the list. However, definitely take the on-line and CD-ROM maps with a grain of salt, as the map data many companies rely on for their Hawaii coverage aren't as good as data for the mainland. Some highways are included that were proposed but never built, or used to be open but now aren't. Most infamously, if you ask for directions from the coastal area of Hawaii Volcanoes National Park to Kapoho to the northeast, at least one of the mapping programs used to route you through an active lava flow, over a highway that has been closed to through traffic for about three decades (last I checked, it has caught on that the road is now closed). Another road that looks like a short-cut on the computer screen, but really isn't, is the private road that used to connect the two segments of the Piilani Highway in south Maui; the detour around that road, closed to the public since the mid-1980s, will add about two hours to your trip. Similarly, if you want to travel between central Oahu and the west coast around Waianae, don't let your computer tell you to drive around Kaena Point (used to be a really bad road there, now it's permanently closed to through vehicle traffic by landslides and a nature preserve), or over Kolekole Pass (the road there goes through two military bases, one an ammunition depot, so that road is really, really closed to the general public with rare exceptions); you'll have no choice but to go the long way, all the way down to Interstate H-1 through southwest Oahu. Also, don't rely too heavily upon drive time estimates from mapping websites and CD-ROMs, which seem not to realize how twisty and slow many of Hawaii's highways can be. For example, one program says it only takes an hour and a half to get to Hana in east Maui from Kahului in the middle of the island. Ha! Three hours is more like it, and that's only if you don't stop to take pictures like most every other tourist. Even if you use online or CD-ROM maps for basic trip planning, I recommend getting current paper maps once you arrive on the islands, and using them instead to get around the islands. My favorite foldup map (though more detailed than most tourists will ever need) is the Reference Maps of the Islands of Hawaii series by James Bier, published by the University of Hawaii, with separate maps for each island except for one combined map for Lanai and Molokai. There are also map books with street-level detail for specific islands, which together cover all six major islands. Hawaiian custom severely frowns on using your horn, except for safety reasons (such as when rounding a blind curve), or as a friendly greeting. 2.7 Speaking of gestures, someone waved at me like this. What did that mean? Relax! 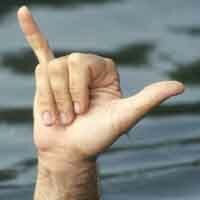 That was a friendly "shaka" or "hang loose" gesture, not unique to the islands but nevertheless particularly popular there. It would be a good idea to get a detailed street map on your arrival. Waikiki can be frustrating to drive around, with not only lots of dead ends, alleys, and one-way streets, but also some convoluted routes to leave Waikiki for points west or to get onto the H-1 freeway (getting into Waikiki is much easier), and heavy congestion from the mix of cars and buses (lots of them). Downtown Honolulu is not as bad, but still has lots of one-way streets, and it can be hard to figure out which streets will take you to the freeway. In both areas, if you look hard enough you can find small guide signs to help point you in the right direction, but on the whole you're better off to consult a map (preferably before heading out) to figure out how to get where you're going. Parking is hard to come by in Waikiki. If you're staying there and want to hit the beach, or go somewhere else on Waikiki, or shop at the big nearby Ala Moana shopping center, you should probably just walk, or take one of the many buses passing through. Parking is not so bad in downtown Honolulu, with a mix of public and private parking garages. In the less densely developed areas of downtown, near the Iolani Palace and the state capitol, you might even be able to find on-street parking (though I more often use the big public garage next to city hall, or the parking garage next to Hawaii DOT headquarters). Posted speed limits on almost all highways in Hawaii are 55 mph or less (often much less). However, the speed limit on a few miles of Interstates H-1 and H-3 (between H-1 exits 2 and 5, and on H-3 in the Halawa Valley west of the trans-Koolau tunnels) increased to 60 mph in May 2002. Speed limit increases are also possible for some other Interstate segments, and a few other highways, but don't hold your breath. Hawaii used to have a maximum speed limit of 65 mph, but reduced it to 55 mph when the National Maximum Speed Limit was enacted in 1973. There the speed limits stayed until 2002, even after all Federal speed limit mandates were repealed, making Hawaii the last vestige of the hated 55 mph NMSL. According to my contacts at Hawaii DOT, there was great reluctance to raise speed limits above 55 mph because even the best of Hawaii's highways are not engineered for safe high-speed travel (due largely to short travel distances -- even on the Big Island -- and very high road construction costs, compared to the mainland). Certainly Hawaii's often narrow and winding highways generally don't lend themselves to high-speed travel. For every road that makes you want to drive fast, there's one where you're constantly leaning on your horn as you crawl around one-lane 5 mph blind cliffside curves, hoping there's nobody on the other side (because if there is, one of you might have to back up a few hundred feet to let the other pass). Even on the freeways, the posted limit is often below 55 mph, with 50 mph typical for the older freeway stretches through Honolulu, and with some short stretches (like the 35-mph 0.7 mile-long S-curve on Interstate H-1 eastbound between exits 18 and 19) posted still lower. In 2007, Hawaii rang in the New Year with increased speeding penalties. Driving 30mph or more over the speed limit, or 80mph or more no matter how high the speed limit, can result in suspension of your driver's license, as well as possible jail time. Hawaii is unusual in that speed enforcement patrols are done only by county police, with different vehicle types and enforcement tactics for each island. The county police department on the Big Island goes one step further, and has its policemen routinely use their personal vehicles on patrol, resulting in a wide variety of nearly unmarked cars (though it seemed to me that there were a lot of sports coupes and SUVs covering the local speed traps). However, that department is gradually transitioning to a county-owned patrol car fleet, starting with some marked Ford Explorer SUVs and Crown Victoria sedans. The county police on Oahu also often use personal vehicles, to supplement the county-owned patrol car fleet. The police in Kauai and Maui Counties use only county-owned patrol cars, though I don't know whether any are unmarked. In general, and especially around Honolulu, beware of speeding crackdowns, prompted by residents' complaints about speeders and "road rage," and a string of fatal accidents from high-speed road racing. On some Big Island roads that offer the most tempting speeding opportunities, most notably Queen Kaahumanu Highway (state route 19) north of Kailua-Kona on the Big Island, Hawaii Belt Road (state route 11) southwest of Hawaii Volcanoes National Park, and unnumbered Waikoloa Road just east of Waikoloa village, expect county police to be waiting for you, often in vehicles marked only by small blue roof beacons. The Mokulele Highway (state route 311) in central Maui has residents concerned about people very impatient to get to the beaches of south Maui, and accordingly draws speed enforcement efforts from the Maui County police. But allow time also for slow drivers ahead of you, including tourists unfamiliar with the area (especially those from Japan, who also have to get used to driving on the right, instead of on the left as they do back home). Local residents sometimes are not in a great hurry to get anywhere, and my "aloha spirit" was sometimes sorely tested while stuck behind them, as they traveled at almost exactly the posted limit (though other drivers have had better luck than I, with the slower drivers pulling onto the shoulder to make way for the overtaking vehicles). Not right now. The Hawaii Superferry briefly ran an auto ferry between Oahu and Maui, with plans to add another ferry vessel and extend service to the Big Island and Kauai. However, in March 2009 it suspended service indefinitely after a Hawaii Supreme Court ruling blocking its continued operation. The Superferry may return to the islands once the legal controversy is resolved, but it is uncertain whether and when it will resume service. Tourists can instead use Hawaii's excellent inter-island airline services (three airlines with frequent jet service between the four largest islands, plus some other carriers with smaller planes also serving Lanai, Molokai, and secondary airports on the other islands). Also check with the car rental companies about special multi-island rates, so you might be able to change cars as necessary while still getting the rate for a single long rental. It varies quite a bit. While it tends to be on the high side, it is not always more expensive than on the mainland (at least not compared to California), though in late 2001 Hawaiians were paying quite a bit more than southern Californians, and complaining quite loudly about the differential. For the islands most popular among tourists, gas prices seem to be lowest on Oahu, and highest on Maui. Some places where gas is unusually expensive are Lanai (only one gas station on the whole island -- $2.649/gal. for regular unleaded in mid-November 2001, well over $3/gal. by late 2004, and topped $5/gal. in 2008), the east end of Maui (only one gas station in Hana, a two hour-plus drive to the next nearest gas station, that often charges about 25-35¢/gallon more than stations in central Maui, and sometimes more), and Molokai (the gas stations in Kaunakakai charge about 10¢/gallon above central Maui prices). I might add that the one gas station now in Hana has only one gas pump with limited hours, and you can get stuck if that one pump goes on the blink or is closed for the day and you don't have enough fuel to get back to central Maui. That happened to me on my first visit to Maui, though I must say that Hana is not too bad a place to get stuck (I just hung out at Hana's spectacular Red Sand Beach while waiting for the pump to be fixed). So make sure you fill up your gas tank before heading out to the Hana area! For the very latest information, see the Hawaii Gas Prices website. In general, tourists at least tolerate the Hana Highway, even though it is very twisty and slow (expect to average no more than 15mph), because it is both an incredibly scenic drive in its own right (bring your camera, and lots of film or memory card space, for the abundant photo opportunities along the way; lots of waterfalls, too, some of them flowing into swimmable pools), and the best way to get to destinations such as the town of Hana and the Oheo Gulch section of Haleakala National Park. (The National Park Service really, really hates it when people refer to Oheo Gulch by the tourism-promoter-contrived misnomer "Seven Sacred Pools." There are at least two dozen pools, none of them more sacred than any others in Hawaii.) But most people turn around at Oheo Gulch, rather than continue on the Piilani Highway back to central Maui, which is even more treacherous and scary than the Hana Highway, and also includes some unpaved segments where you can get stuck if the road is wet. I personally think the Piilani Highway is very interesting, and a great drive, in its own right (thus my devoting two photos pages to publicizing it), but then again I do have a weakness for bad roads, and the Piilani Highway through east Maui is one of Hawaii's classic bad roads. See the (Ala Mauna) Saddle Road photos page (highway was renamed in 2007) for photos and other information on how that road has long been seriously substandard, and also on plans (about halfway completed) to improve and reroute the highway to create a more direct, rental car-friendly cross-island shortcut between Hilo and Kailua-Kona. That is the one road that most though not all rental car companies specifically forbid for most or all of their vehicles, and indeed may be the only paved state highway in the United States that is open to motor vehicles, but off-limits to most rental cars. That restriction has the side effect of limiting tourist travel on some side roads accessible only from Ala Mauna Saddle Road or from even more difficult unpaved roads, such as unnumbered Mauna Kea Access Road (John A. Burns Way) to the Mauna Kea summit and the visitor center near the bottom of the mountain. The Big Island also has some other roads that make the rental car companies unhappy. South Point Road, to Ka Lae (southernmost point in the United States) and Green Sand Beach, is a narrow unnumbered county road, most of it with only one lane of pavement (with unpaved shoulders, so you can pull over to yield to oncoming traffic). The access road into the Waipio Valley, at the west end of state route 240, is paved but extraordinarily steep (grade averaging 25% and at points reportedly up to 45%, only ¾ mile long but enough to destroy your brakes on the way down), restricted to 4x4s and very dangerous (sometimes fatally so) for other vehicles. On Maui, the county section of the Piilani Highway around the south side of the Haleakala volcano (county route 31) includes several unpaved miles, which were normally off-limits to rental vehicles even before it was closed to through traffic (until at least October 2008) due to earthquake damage, but that didn't seem to deter all the tourists I saw there in white convertibles. The county portion of the Kahekili Highway around the northwest coast of Maui (part of route 340), a slow, twisty alternate route with narrow pavement from central Maui to the Lahaina area, also historically has been disfavored by the rental car companies. Now that the road is completely paved (but still pretty scary), that road is not covered by the usual unpaved roads restriction, and seems to be generally open to rental cars. But I've heard of some companies specifically keeping it off-limits, so it would be a good idea for visitors to check their car rental contracts before traveling the road. The rough unpaved portion of the old Farrington Highway (between state routes 93 and 930), near Oahu's northwest corner at Kaena Point, is also very rental car-unfriendly, though the permanent closure of the road for through travel around the point makes that less of an issue than it apparently used to be. Most visitors to Kaena Point just park their cars in the lot where the route 930 pavement ends, and take an easy three-mile hike (one-way) to the point. Most roads on Lanai are unpaved, so there aren't too many places you can go with a conventional rental car. The local rental agencies have mainly 4x4s in their inventories, for you to take on the island's better unpaved roads (some of the tougher ones remain off-limits, and the scenic Munro Trail can be impassable when wet even for 4x4s), but make sure to call well in advance to reserve one. <groan> As the maps suggest, there aren't a lot of escape routes in the areas downhill from those volcanoes, but don't worry! Volcanic activity will occasionally require road closures and evacuations (mainly on the southern half of the Big Island -- though Maui's Haleakala volcano apparently last erupted about two centuries ago, so you can't count it out completely, and Mauna Kea on the Big Island's north side is not quite extinct either). But Hawaii's volcanoes usually do not erupt explosively like Mt. St. Helens did, are monitored very closely (the ever-erupting Kilauea volcano is said to be the most closely-watched volcano in the world), and their slow-moving lava flows are rather predictable and easy to walk away from if necessary. Lava-watching is a safe, enjoyable, and unique tourist activity, so long as you stay on open roads, and if you hike off-road are properly prepared and observe the signs guiding you to safe vantage points (the signs will also tell you all the interesting ways you can die, if you stray from established trails). Those sirens are mainly to alert residents to get (or stay) away from low-lying coastal areas in the event of a tsunami ("tidal wave"), much more dangerous than the usually predictable and slow lava flows in Hawaii. Hawaii is vulnerable to tsunamis triggered by major earthquakes far away (such as off the coast of Alaska), and also on very short notice after one of the more severe local earthquakes (such as the one on part of the Big Island's southeastern coast in 1975). Tsunamis don't happen that often in Hawaii (three major ones in the last sixty years, plus the localized 1975 Big Island tsunami), but just in case, tourists should review the local phone books for what to do when the sirens sound. And if you're on the beach when an earthquake hits and/or the tide suddenly recedes far from shore, don't wait for the sirens -- run like hell, away from the water, just in case. 2.18 What's the meaning of those "kapu" signs often seen along roadsides? "Kapu" is Hawaiian for "taboo." On a sign, it means "keep out" or "no trespassing" (only with a harder edge -- for the ancient Hawaiians, "kapu" violations were capital offenses). As far as I know, there are only three highway rest areas in the entire state, all about halfway to Hana on Maui's Hana Highway (one off on the side road to Keanae, the two waysides right on the highway about four miles to the west and six miles to the east). I don't recall seeing any truck stops at all, just the off-highway terminals where local trucking companies are based. The islands are small enough that most journeys are short and don't require rest or other breaks, and most or all truck routes on any of the islands can be done round-trip in a single day and on a single load of fuel. The trip to Hana is an exception, taking lots of tourist traffic through an area with otherwise limited restroom facilities next to the highway, and taking long enough (at least three hours) that travelers can't all just hold it in until they reach their destinations. On other long treks (such as across the Big Island), along the way restrooms will usually be available to travelers in state and county parks, or gas stations. The Hawaiian alphabet has just twelve letters, only seven of which are consonants (h, k, l, m, n, p, and w). So Hawaiians have to work their vowels really, really hard ;-) The most notable example of that is the consonant-challenged Honolulu suburb of Aiea. My favorite on-line resource is the Hawaiian Language web site. It's very good for the basic phrases tourists need to know, including the various ways to say "I love you" in Hawaiian (for calling or writing back home), as well as some of the less pleasant phrases they may encounter (in addition to the local favorite "haole"). A more comprehensive book focusing on place names is Mary Kawena Pukui, Samuel H. Elbert & Esther T. Mookini, Place Names of Hawaii (Univ. of Hawaii Press, 2nd ed. 1974). © Oscar Voss. Last updated December 2010.